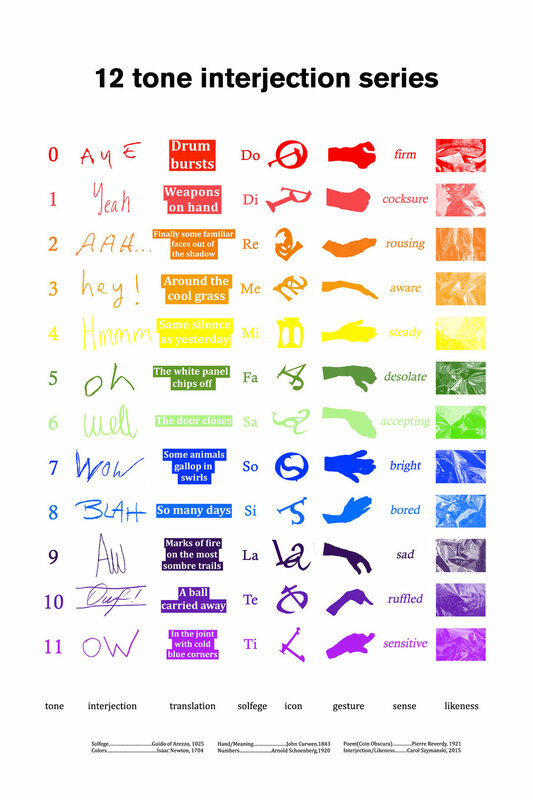 The 12 tone interjection series maps sequences of tones, interjections, translations, solfege syllables, icons, gestures, senses and likeness on to the colors of the spectrum. SOLFEGE Guido of Arezzo, regarded as the inventor of modern musical notation in the eleventh century, developed mnemonic solmization a technique of assigning a syllable to each note of a scale—here, Do, Di, Re, Me, Mi, Fa, Sa, So, Si, La, Te, Ti. COLORS Isaac Newton associated the seven solfege syllables with the seven colors of the rainbow and surmised that each color vibrated accordingly. Subsequently I assigned the remaining five tones of the chromatic scale. GESTURES John Curwen designed a system called tonic sol-fa to aid in sight reading of the stave which included manual signs for tones along with associated titles that gave meaning to the notes. TONES Arnold Schoenberg developed a compositional method, based on manipulating an ordered series of all twelve notes of the chromatic scale, called serialism or dodecaphony. Twelve notes of equal value represented by the numbers 0-11. INTERJECTIONS Twelve exclamations that express a particular emotion or sentiment (aye, yeah, aah, hey, hmmm, oh, well, wow, blah, aw, ouf, ow ). Such interjections are where verbal and nonverbal expression meet. These are visually differentiated through the handwriting of twelve different writers. TRANSLATIONS “Coin Obscure,” a poem by Pierre Reverdy, translated by three people stanza by stanza, taken from entry 955 Jursidiction of cockshut dummy—a recently completed eleven-year email/book project following the plan of Roget’s Thesaurus. This translation along with the interjections becomes the libretto of a musical performance Lost Edge of a Square/Dark Corner/Obscure Corner by Betsy McClelland, performed by the Ekmeles Vocal Ensemble under the direction of Jeffrey Gavett. ICONS The solfege syllables reconfigured into abstract symbols using a font I designed in the 1980s. This font was utilized as the form of many of my early sculptural works and similarly has been redeployed in "My life is an index" in the form of paintings and inflatable sculptures. SENSE Meaning assigned to John Curwen’s hand signs of which I further elaborated to include the whole chromatic scale. LIKENESS Colored reflections on the inflatable sculptures from the paintings based on the icons referenced above were photographed to make Cibachrome prints. The musical composition Lost Edge of a Square/Dark Corner/Obscure Corner based on the artist’s transformation of a poem by Pierre Reverdy will be performed at the Tanya Grunert Gallery on Friday, October 4 at 5pm.